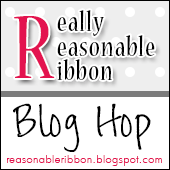 It's time again for the AWESOME Really Reasonable Ribbon Blog Hop. Hopefully, you have just arrived here from the talented Bonnie Garby's Blog; but just in case you didn't, you can always go back and get started on the Really Reasonable Ribbon Blog. There are SO many fabulous projects this month, and you won't want to miss a single one. Many of the projects shared on this Blog Hop will showcase ribbons from our August Ribbon Club Assortment - and they're FABULOUS! 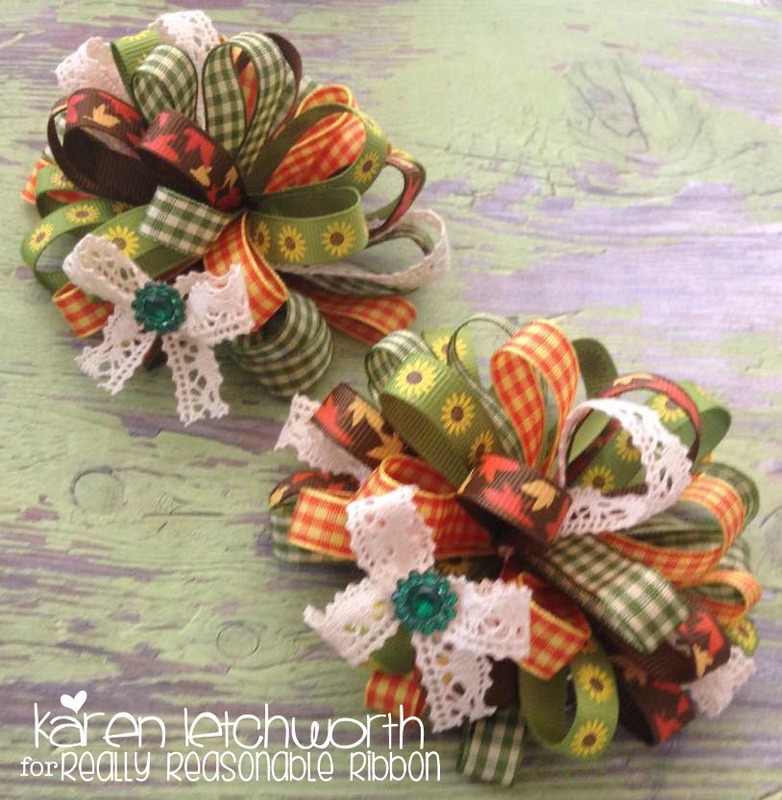 How sweet are these little hair bows using this month's lovely Ribbon Club Assortment? This month's collection is FILLED with the wonderful colors of Autumn, and are perfect for all your Fall crafting projects. Really Reasonable Ribbon carries all sorts of great Headbands and Clips; but these little cuties were created using the 40 mm French Clips which are perfect for smaller girls' hair. These lovely French Clips come in SIX different sizes to accommodate ALL hair lengths and thicknesses. And....they stay in place all day while your little ones bounce around, play, swim, roll, etc. They really stay secure nicely. At Really Reasonable Ribbon, you can find the perfect size clips for any hair length and thickness; and all the perfect ribbons as well. When you focus in on these ribbons, you can really see all the WONDERFUL textures and designs they offer. I used the 3/8" Plaid Ribbon in Moss/Cream, 3/8" Plaid Ribbon In Yellow/Orange, Leaves on Tuftan Brown Grosgrain Ribbon, Debra Natural Crochet Lace, and the adorable Sunflowers on Kiwi Grosgrain Ribbon. Each of Really Reasonable Ribbon's products compliments the next SO wonderfully. That's one of the many things I love so much about them. Your next stop on the Blog Hop is at the lovely and talented Teresa Horner's Blog, and I know that she has prepared something extra special to share with you all. Don't forget to answer the question at the end of the Blog Hop to be eligible for the grand prize. We hope you enjoy every stop along the way, and that you gain LOTS of great inspiration for using Really Reasonable Ribbons on your next project. What fun and colorful hair bows you've created!! 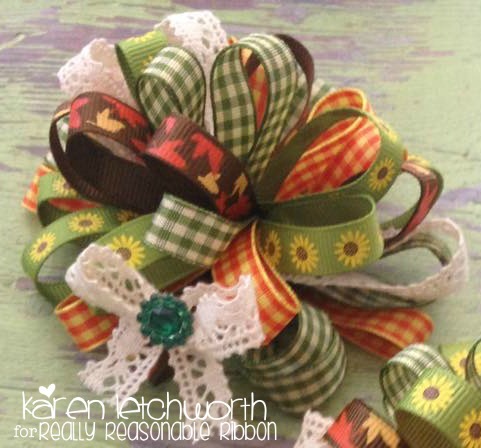 I just love seeing the mix of all those yummy fall colored ribbons together!! Beautiful us of ribbons Karen. Love the flowers. Wow they look like they would have taken ages to make and who wouldn't notice them when worn in the hair, thanks for sharing. LOVE love love your hair clips Karen. They are fantastic! Wow, wish my hair was long so I could order these wonderful hair clips. This was great way to show off all the beautiful colors . oh Karen, everything you make is always pure delight! these little hair bows are just as sweet as can possibly be! I hope the wedding was pure perfection! sorry I haven't been by in ages. have been taking a break from blogging for a bit. Oh my, these are so pretty. I can imagine using these as accents to a package or a gift bag, or even a topper for a jar! So pretty! Perfect hair bows for the upcoming fall season. So pretty, but i don't have any girls to use them on and i'm too old for hair bows. lol Love the colors in your hair clips. Cute hair bows! You do such a great job with these! Oh these are gorgeous - fabulous colours and I love the touch of lace. Great to know they will 'stay put' all day too! I so hope you have a little girl to wear these beautiful bows in her hair. Great job. These are adorable--love all these ribbons together. Beautiful bows. I love the ribbon and lace combination. Thanks for sharing. Such lovely bows, Karen. You always inspire me with your amazing creations. I love hair bows for little girls! These are sooo cute and ready to go on that pumpkin patch trip!!!! Very Beautiful bow and great colors as well. Gorgeous bows! I love how you managed to use so many of the ribbons on this and they just all co-ordinate so great! For those that wouldn't use them as hair bows, with just a bit of tweaking, these would be great bows for a gift on a present as well. Gorgeous hair bows! 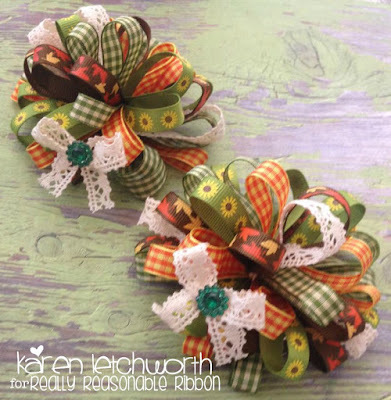 Love that crochet lace trim and all these pretty fall colored ribbons! I love the way you showcased a variety of ribbon on these hair bows. When I saw this months package of ribbons I did not just love the colors but I also enjoy all the wonderful textures. You really did a great job with both!